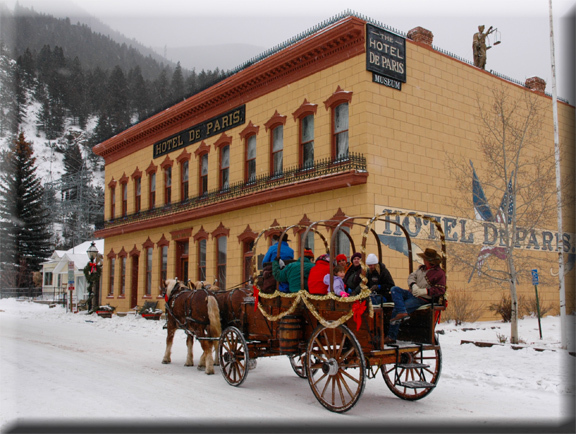 The Hotel de Paris in Georgetown, Colorado, dates to the silver mining boom, when it served as a first-class French restaurant, showroom for traveling salesmen, and luxurious hotel during the Gilded Age. Georgetown (population 1,088) was first settled by prospectors lured to the area by the discovery of gold and silver. The town was incorporated in 1868 and became known as “The Silver Queen of the Rockies.” In 1884, the Georgetown Loop was constructed, a narrow gauge rail line linking Georgetown with the nearby community of Silver Plume. During the 1880s and through the early 1900s, the area’s spectacular scenery made Georgetown and the Georgetown Loop a center for tourist railroad excursions. The town’s fortunes began to wane, however, with the advent of the automobile, and the Georgetown Loop was dismantled in 1938. This was followed by closing of the mines in the 1940s. In subsequent decades, however, new emphasis on the community’s heritage assets has helped reinvigorate tourism. The Georgetown-Silver Plume Historic District was designated a National Historic Landmark in 1966, and Georgetown passed the state’s first historic preservation/design review ordinance in 1970. In 2003, the new Gateway Visitor Center opened at the Georgetown exit from the interstate and greeted more than 230,000 visitors in its first year of operation. Heritage tourists can visit the restored Hotel de Paris (1875), long famed as one of the West's most elegant inns, and the Hamill House (1879), home of silver baron William A. Hamill. Also, the Georgetown Loop has been reconstructed and reopened by the Colorado Historical Society as part of a larger railroad and mining park that interprets these important themes in the state’s history.